In its special role as the simplest of all atoms, hydrogen has starred in some great episodes in the history of science. Numbers are so important in physics that real numbers alone are not enough: imaginary numbers are also used and often appear in the equations of physics. Physicists are enamored with numbers, so imaginary numbers are not that surprising; however, it is a bit surprising that an imaginary cat appears in the lore of physics. The cat belongs to Erwin Schrodinger. This imaginary cat was invented in 1935 as part of a thought experiment designed to probe the implications of the subject that Schrodinger himself helped to create—quantum mechanics. And because the interpretation of quantum mechanics has proven so provocative and continues to challenge our understanding, Schrodinger's imaginary cat still lives. Recently, the cat moved from the realm of the imagination into the laboratory. After we consider Schrodinger's role in the creation of quantum mechanics, we shall return to the curious cat. tems, the intellectual logjam broke open and there was an outpouring of epoch-making results. 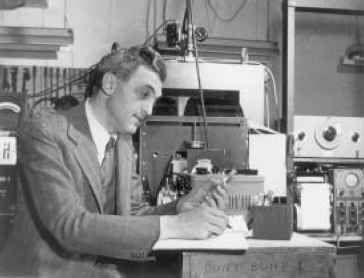 At the beginning of 1926, there were essentially two versions of quantum mechanics. On January 27, 1926, a manuscript containing a third version was received by the editors of the prestigious German physics journal Annalen der Physik. The author was Erwin Schrödinger, a professor of theoretical physics at the University of Zurich (see Figure 8.1). This paper was the first of six papers that Schrödinger, in an outburst of creative activity, wrote during the first six months of 1926. All the papers were fundamentally important, but the first paper was special. In this first paper, Schrödinger developed his version of quantum mechanics with the aid of the hydrogen atom. Two stumbling blocks make it difficult to track the thought processes that led to his classic papers. First, unlike Heisenberg, who chronicled his thoughts in letters to Pauli and others, Schrödinger did not reveal himself as extensively in letters. He did keep journals, but key journals in this sequence have been lost. Schrödinger himself never provided a chronological account of how he arrived at his famous result. Second, Schrödinger's insights apparently came to him over such a compressed time period that attempts to reconstruct the evolution of his thought processes are difficult. We do, however, know a few things. We know, for example, that in late 1925 Schrödinger read Louis de Broglie's paper in which the young de Broglie proposed that particles have an associated wavelength. Schrödinger sent a letter to Einstein on November 3 in which he wrote, "A few days ago I read with the greatest interest the ingenious thesis of Louis de Broglie, which I finally got hold of. "1 We also know that Peter Debye, Schrödinger's colleague in Zurich, suggested that Schrödinger give a talk on the de Broglie paper at the joint Zurich Federal Institute of Technology (E.T.H. )-University of Zürich colloquium. The colloquium probably occurred in November, shortly after Schrödinger posted his letter to Einstein. And we know further that Schrödinger went to work attempting to generalize de Broglie's concept of matter waves and treated it in the context of relativity theory. In fact, evidence suggests that Schrödinger first arrived at a relativistic form of his famous wave equation, which he rejected because it seemed at odds with available data. Had he known about electron spin, discovered a short time earlier, his rel-ativistic result would have been very encouraging indeed. Unfortunately, no manuscript of Schrödinger's relativistic version exists. Still further, we know that Schrödinger was philosophically attracted to the continuity of waves and the way waves are repre sented mathematically. Finally, we know that Schrödinger left for a holiday shortly before Christmas 1925 and did not return until early January 1926. The holiday at the Villa Herwig in Arosa was special. Accompanying Schrödinger was a young woman, whose identity remains a mystery. It was during this romantic interlude that Schrödinger arrived at his version of quantum mechanics, which, for a period of time, was called wave mechanics to distinguish it from Heisen-berg's quantum mechanics. In January, Schrödinger submitted his manuscript for publication. The first sentence of Schrödinger's classic paper reads as follows: "In this paper I wish to consider, first, the simplest case of the hydrogen atom, and show that the customary quantum conditions can be replaced by another postulate, in which the notion of 'whole numbers,' merely as such, is not introduced. "2 Two things about this sentence are noteworthy. First, an explanation of the hydrogen atom is clearly the objective of Schrödinger's wave mechanics. Second, in the development that follows this introductory sentence, quantum numbers ("whole numbers"), which appeared in Bohr's model of the hydrogen atom in a somewhat ad hoc fashion, appear as a natural consequence of Schrödinger's physical and mathematical approach. In arriving at his interpretation of the called the wave function, Born was influenced by the way Einstein had tried to make the wave-particle duality of light comprehensible. In addition, Born was influenced by the atomic scattering experiments of his Göttingen colleague, James Franck, which for Born had a definite particle nature. "Every experiment by Franck and his assistants on electron collisions," said Born, "appeared to me as a new proof of the corpuscular nature of the electron. "8 When an electron is scattered from an atom, it can go in any direction depending on the nature of the collision. Born equated or rather |^|2, with the probability that the electron would be scattered through a particular angle. At an angle where the quantity 2 was large, the likelihood of detecting the electron at this angle was large. At an angle where |^|2 was zero, the probability of detecting the electron there was zero. When applied to the hydrogen atom, the magnitude of the quantity 2 indicates where the electron is most likely to be found: where the value of 2 is large, that's where the probability is largest for locating the electron. Figure 8.2 shows a plot of 2 from the center of the hydrogen atom, r = 0, to larger distances from the atom's center. We see that |^|2 has its largest value at a particular radial distance from the atom's center and this is where the electron spends most of its time. Schrödinger's quantum mechanics reveals this distance to be 0.529Ä. The value 0.5Ä agrees not only with Bohr's model of the hydrogen atom, it also agrees with the known size of the hydrogen atom, whose diameter is about 1A. Schrodinger's theory and Born's interpretation are in agreement. Figure 8.2 The magnitude of the quantity \tp\2 represents the probability of where the electron is likely to be found. It is a maximum at rHyd, which determines the radius of the hydrogen atom. From this beginning, the quantity t came to be associated with probability, although of a different nature than physicists were accustomed to. Probability prior to Born was the result of ignorance. When a gambler throws dice, the details of the throw, details of the dice themselves, and details of the surface onto which the dice are thrown are not known precisely and this ignorance precludes predicting the outcome exactly. If all these details were known with absolute precision, the outcome of a dice throw could, in principle, be calculated. In our ignorance of these details, only the probability of a particular outcome, say a double six, can be given. 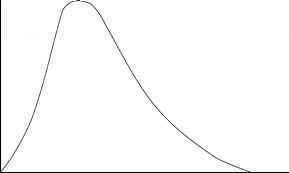 Born's probabilistic interpretation of t was fundamentally different. The probability of atomic events, say the decay of a single neutron, is not a probability of ignorance. Rather, the quantum laws that govern the decay process are inherently probabilistic. There are no details lacking; there is no ignorance. The quantum processes are probabilistic in their basic character. There is no way we can say when a neutron will decay; all we can say of a neutron is that in the next ten or twenty minutes there is a certain probability that the neutron will decay into a proton and an electron. This interpretation of p brought wrenching change to physics. The laws of physics, prior to quantum mechanics, were laws of certainty. For example, physicists can predict absolutely when and where solar eclipses will occur. This certainty, however, is a consequence of scale: the Sun, Earth, and Moon are so massive that the inherent quantum behavior of these bodies is too small to affect their gross behaviors. However, at nature's most basic level, the domain of the basic building blocks of the material world, the laws of nature are laws of probability. Einstein could not accept this and his oft-quoted remark that God does not play dice reflects his rejection of the probabilistic interpretation of quantum behavior. Schrödinger himself never accepted the offspring of his own work, quantum probability. In August 1926, Schrödinger wrote to Willy Wien: "today I no longer like to assume with Born that an individual process ... is 'absolutely random,' i.e., completely undetermined. I no longer believe today that this conception accomplishes much. "9 With no intention of doing so, Schrödinger had changed the nature of physical reality. Whether or not physicists immediately accepted the implications of Schrödinger's quantum mechanics, they were pragmatic and recognized the opportunities inherent in the new mathematical formalism. "The Schrödinger theory came as a great relief," said George Uhlenbeck, the co-discoverer of electron spin.10 Compared to the strange matrix mathematics, which conveyed Heisenberg's quantum mechanics, the mathematics of Schrödinger was familiar and physicists knew how to use it. And use it they did. Experimental results had been accumulating and Schrödinger's equation was applied to many atomic problems with stunning results. Heisenberg and Schrödinger each created their theories for the exact same purpose: namely, to provide a theoretical framework for explaining the results of measurements made on atoms. For each author, success with the hydrogen atom proved the validity of the theory. Yet, though they were identically motivated, their results were radically different conceptually and mathematically. Heisenberg's quantum mechanics was expressed in terms of matrices, noncommuting quantities, and strange computation rules. Schrödinger's quantum mechanics started with a partial differential equation, the Schrödinger equation, which was solved by well-established methods. The Heisenberg quantum mechanics was conceptualized in terms of discreteness and the particle was the underlying image. The Schrödinger quantum mechanics was conceptualized in terms of continuity and the wave was the underlying image. The differences between the two theories intrigued Schrödinger and in late February he set out to examine them. In March he sent a paper to Annalen der Physik that contained the results of his analysis. The first sentence of the paper sets the stage: "Considering the extraordinary differences between the two startingpoints and the concepts of Heisenberg's quantum mechanics and of the theory that has been designated 'undulatory' or 'physical' mechanics, and has lately been described here, it is very strange that these two theories agree with one another with regard to the known facts. "11 In what followed, Schrödinger demonstrated the formal equivalence between the two theories—Heisenberg's and his own. Heisenberg recognized the need to resolve the deep-seated differences between the two approaches. A face-to-face discussion with Schrödinger at a neutral site might accomplish a resolution. Where would be better for such a discussion than Copenhagen, where Bohr could participate? On September 11, 1926, Bohr wrote a letter to Schrödinger inviting him to Copenhagen to give a lecture on wave mechanics and to participate in "some discussions for the narrower circle of those who work here at the Institute, in which we can deal more deeply with the open questions of atomic theory. "13 The narrower circle would include, among others, Bohr, Heisenberg, and Dirac. Schrödinger arrived in Copenhagen on October 1 and, as told by Heisenberg, "Bohr's discussions with Schrödinger began at the railway station and were continued daily from early morning until late at night. Schrödinger stayed at Bohr's house so that nothing could interrupt the conversations. "14 Schrödinger attacked quantum jumps; Bohr acknowledged that they could not be visualized, but defended them. Schrödinger wanted to know what went on in the atom; Bohr countered with the claim that concepts drawn from everyday experience could not be applied to the atom. On and on the discussions went until Schrödinger fell ill. Mrs. Bohr brought food and tea to the ailing Schrödinger while Niels Bohr sat on the edge of the bed, continuing to argue. Fortunately, Schrödinger did have something to do with quantum theory. 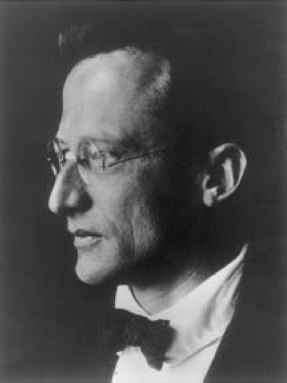 From his Christmas vacation in Arosa through the first half of 1926, Schrödinger wrote six papers that guided and shaped both physics and chemistry in the decades that followed. In the first paper, the hydrogen atom played a decisive role. Schrödinger's treatment of the hydrogen atom found in that paper has essentially been duplicated in scores of textbooks from then to the present time. Schrödinger returned to the hydrogen atom in the third paper of the series, in which he applied his quantum mechanical approach to what is known as the Stark effect. If hydrogen atoms are placed in an electric field, the spectral lines associated with the Balmer series are altered. Specifically, each spectral line is split into a close-knit group of lines. Schrödinger successfully accounted for this splitting, called the Stark effect, and thereby used the hydrogen atom to explain it. With his quantum mechanics, Schrödinger created a powerful formalism for treating atoms and molecules. Schrödinger's version of quantum mechanics was preferred by physicists through the 1930s. As the years passed, however, physicists mastered the matrix mathematics that was the basis of Heisenberg's quantum mechanics and with that mastery they discovered that some problems are treated more naturally with the matrix approach. Today, both approaches are used equally. The application of quantum mechanics to physical problems is now routine with most physicists. It is used daily to guide the design of experiments and to explain their results. Every prediction made by means of quantum mechanics has been accurate. It has been an enormously successful physical theory, yet one that no physicist will claim to understand. From the beginning it was apparent that quantum mechanics required a new and novel way of thinking about the natural world and about reality. That brings us back to Schrödinger's cat. Schrödinger was increasingly uncomfortable with the interpretation of quantum mechanics that gained widespread acceptance. This interpretation was, not surprisingly, largely influenced by Bohr and was called the Copenhagen interpretation. In the Copenhagen interpretation, if a physical system can exist in more than one state, say two states, the physical system exists in a condition that is "smeared" between the two states. In the jargon of quantum mechanics, it is said that the system exists in the superposition of two states. Schrödinger did not like this ambiguity. To convey his intellectual discomfort, he introduced his imaginary cat. Hypothetically, the cat was enclosed in a chamber with a radioactive substance selected so that in a certain time period there is a 50-50 chance of decay. If decay occurs, the cat dies; if decay does not occur, the cat lives. So the cat, in terms of the Copenhagen interpretation of quantum mechanics, exists simultaneously in two states. It is neither alive nor dead, but half-alive and half-dead—clearly, a paradox. tion, however, is changing: the cat appears to be emerging from the murky realm of the imagination. A very ingenious experiment, designed by David Wineland and his associates, has been designed for a system intermediate between the subatomic and macroscopic domains. It promises to shed light on the shadowy boundary between the world of the electron and the world of human-sized objects.17 This experiment is a close analog of the imaginary cat in its imaginary chamber. The results are still being debated, but it seems that the paradoxical situation continues to exist on the small scale of this experiment. Further experimentation and careful analysis are needed. It may be that physicists have not yet created an atomic version of a fully creditable cat, but it does appear that they may have produced quantum-like kittens. It would be a stretch to link the hydrogen atom with Schro-dinger's cat, yet the hydrogen atom has played an integral role in the development of quantum mechanics. Quantum mechanics has brought physicists face to face with intellectual challenges that defy resolution. It is not surprising that the enigmatic cat is a part of this conundrum. How did the hydrogen atom deal with technology? Did Erwin Schrodinger use particle accelerator for his theory? Did Erwin Schrödinger have an actual cat? What did Louis de Broglie,Werner Heisenberg,Erwin Schrodinger discover? Is the hydrogen atom simplest of all atoms? When did erwin schrödinger make the wave mechanical model of the atom? How did erwin schrodinger further our understanding of the atomic structure? How schroedinger used bohr's ideas of an atom? What does schrodinger's Cat have to do with Atoms? What model of the atom did Erwin Schrodinger developed? What did schrodinger and heisenberg dicover about the atom? How to thinl like a genius erwin schrodinger book? What do Schrodinger's theory of the hydrogen atom say? What are improvement of Schrödinger's quantum mechanical treatment of hydrogenic atoms? Why was hydrogen atom very important to erwin schrodinger?